2.7 "No organophosphorous nerve agents, their degradation products or synthesis impurities were detected either in environmental samples prioritised for analysis or in plasma samples from alleged casualties." I think this is technically wrong, unless something changed. The commercial pesticide malation was found on a headscarf, presumably from a female fatality, reportedly found in the basement of location 2 (this is still included; see annex 5, sample code FFM49-18SDS07 ). This can be used to kill headlice, when that's done - here, rather close to a chemical death, that malathion could perhaps explain, in a gas chamber scenario. I hear there's a toxicity issue where it usually just kills insects, but if it can make people sick, it could kill them eventually, in a gas chamber if not on open release. I wouldn't guess Malathion as the killer here, but I'm not confident that scarf finding is a coincidence. Dual Chemical Properties: Was There Sarin? Previously it's seemed there was no open chemical release, based on widespread agreement by many locals who swear they smelled nothing, and inconsistent stories from some who did claim a smell. Putting this aside, perhaps there was a limited release in a small area ... if so, what the FFM heard could be helpful. The FFM seem to have heard about two different chemicals released in the open. Judging by reported smell, color, and immediate symptoms, it comes down into two very familiar types. "8.59 The smell was described as being similar to cleaning products containing chlorine and local commercial brands, such as “Clor” and “Flash”, were mentioned. They added that the odour was significantly stronger, more pungent and acidic than the cleaning products. Other witnesses described a strong unpleasant smell that was not similar to chlorine and caused shortness of breath, fatigue and blurred vision. The smell of chlorine was also mentioned to be present at Point One around the same time." "8.60 Witnesses recounted that, as soon as they perceived the odour, they developed difficulty breathing, eye irritation, severe coughing, nausea, vomiting, weakness, visual impairment, and excess salivation." This is upon smelling which chemical? Irritant properties and resultant breathing problems could be from either (chlorine by its own action, the other due to irritant impurities). That covers the first three symptoms as too general to clarify. The next five all point more clearly to nerve agents like sarin; vision goes blurry or dark (but external miosis is usually noted), the SLUDGE syndrome causes extra saliva, actual nausea and vomiting (neither of which comes from chlorine - occasional reflexive vomiting, but not nausea), and weakness / fatigue, along with a bad headache, are common on minor sarin exposure. If these reports are true, it's an issue to note. "...This cloud was witnessed on the streets in close proximity to the vehicle entrance of the tunnel leading to the emergency department of Point One and on the ground floor of Location 2." 8.68 Three casualties stated that another device had landed and released chlorine gas in front of their house approximately 50 to 60 meters from the basement at Location 2. Additionally, several witnesses stated that they perceived the odour of a chemical at different locations within 250 meters southwest of Point One. "A chemical" could mean the one that smelled unlike chlorine. But 250 meters southwest of the medical Point One is roughly in the same area around location 2 (itself about 200 m sw of point one). Unless that 50-60 meters is off in another direction, these might describe the same limited area. 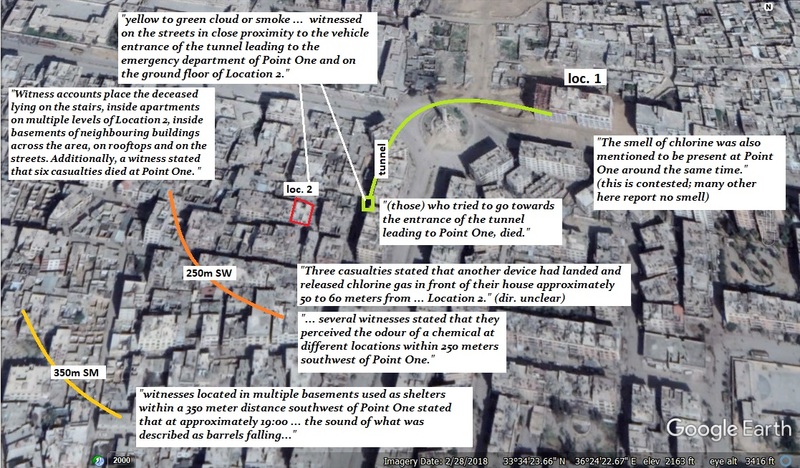 (map...) Maybe these are just differing descriptions of the smell(s) in that one area, which most Douma people would not have been in (and thus would report - accurately as far as they know - that there was no gas released). I don't have enough information yet to say just where anything was released, or if any of these claims are true, but FWIW, here's the best weather record I know of - not a darksky.net prediction but actual readings from Damascus International airport a few miles south of Douma. Annex 8, on the opposition chemical warehouse suspected of producing chemical weapons: "Some of the chemicals observed could be used to manufacture at least two of the Schedule 3A chemicals, hydrogen cyanide and cyanogen chloride, both highly toxic blood agents (not found on the location)." One of those is the main basis for Zyklon B, which has worked well at killing people in gas chambers, if not as a battlefield chemical weapon. I don't think this was used (no signs in the environment mentioned at either site, and symptoms don't match), but it's worth noting for an example; they didn't rule out the substance used to kill these people - and it doesn't even need to be schedule 3A - was made here. Also, the FFM specifies it didn't look like sarin was made there. But until I know more, I'd consider it likely enough this was an explosives etc. plant, as they concluded. It shouldn't be ruled out of relevance that easily, but it's not a clear lead to anything at the moment. As noted above, there were reports of symptoms that chlorine is unlikely to cause, and point more to a nerve agent. But that's reported by people who lived and, like all living people, could be lying. What matters most is the people who died and what killed them. Contrary to what some people say, a dead body can tell you how the person died. The message isn't always clearly readable, even to experts, but it's there. Sudden Death or … Death Elsewhere? "8.96 The location, positions and lack of visible trauma on the victims in the videos taken inside the building indicate exposure to a rapidly incapacitating or a highly toxic substance. The victims do not appear to have been in the midst of attempting self-extrication or respiratory protection when they collapsed, indicating a very rapid or instant onset. This type of rapid collapse is indicative of an agent capable of quickly killing or immobilising." In fact, their deaths look so instant it's almost as if they were dead before they dropped in these spots - or were dropped in these spots, depending. Either way, the only chemical weapon they found sign of in the house was chlorine, and it only causes instant death in a fluke case of laryngospasm, not something that would hit 35+ people at once. Usually it doesn't paralyze or cause unconsciousness (reports out of Syria disagree on this, and they lose the disagreement. They can't re-write science that easily - see here). It causes people to want to leave, and usually they will, and nearly all would survive the limited exposure. So what they have here is an unsolved mystery, suggesting that perhaps these people died somewhere else with different chemicals present. The bodies have never been tested. If the place they died hasn't either, we know next to nothing. A best guess (not the FFM's) would be some dead bodies of gassed people were moved to a place where chlorine was released. They would likely be transported there via the underground tunnels that open about one block from this building. This would be guarded, everyone told to stay inside due to the gas, and anyone who came too close might be shot. As the FFM heard it explained, "Other casualties who ... tried to go towards the entrance of the tunnel leading to Point One, died." But that's because of the chlorine gas in the open there was so especially deadly? "8.90 ... white, foam-like oral and nasal secretions, similar in appearance to fulminate pulmonary oedema but in multiple cases much more profound and seemingly persistent." "8.98 The airway secretions seen in many cases are similar to those seen with exposure to some chemical weapons, toxic industrial chemicals and toxic doses of pharmaceutical agents but are more profound and seem to have a consistency more like viscous foam than secretions typically originating from the upper or lower airways. Notably, there are casualties both with and without secretions that are in very close proximity to one another." All odd, but then they close: "In general, the presence and context of the airway secretions indicate exposure to a chemical substance." But aside from generalities, they note it looks different than usual, with bubbles that often don't pop, leaving little dried foam sculptures on some faces. Many (not the FFM) say it looks fake. I would say that, but I'm not sure it really is fake. There are many unknowns about just what they inhaled under what conditions (suffering dehydration? Some kind of thickening dust breathed in as well? Etc.? All unknown). And the foam that's discolored orange or pink seems to be genuinely coming from inside airways clogged with blood and/or mucous and/or unknown substances. So I'm urging caution here in calling clear fake. It's an oddity at least that raises questions that seem hard to answer. "8.90 ... One female victim displays corneal opacity. Due to the quality of the videos and the angles of recording, no further ocular signs are noted." One lacking sign of chlorine exposure is red eyes. It should be in about 100% of cases, but it's seen in about 0%. And this isn't because of bad video or angles - the whites are seen, and they have no pink shift. Another feature that's seen in one boy anyway is tache noir, black spots on the white of the eye, an infrequent sign of death, like the clouding (corneal opacity) observed in several cases, not just one woman. 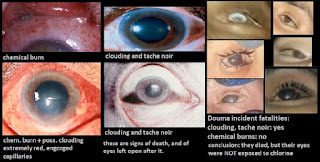 "8.97 The corneal opacity seen in many of the victims is similar to ocular injuries seen with acid or alkali burns but also resembles post-mortem changes. The interval between death and the time the video/photos were taken is quite broad. " AFAIK, it's consistent with injuries in the past that have healed into opaque scar tissue. It's NOT consistent with people who just now died from chemicals that burn the eyes. In that case, they would be freshly red, which they aren't. My research suggests corneal irritation, whether from excessively acidic or alkaline substances, always appears as redness of the kind we all know. There's no white irritation I could find. "8.90 ... Several victims display degrees of periorbital discoloration and early signs of livor mortis." 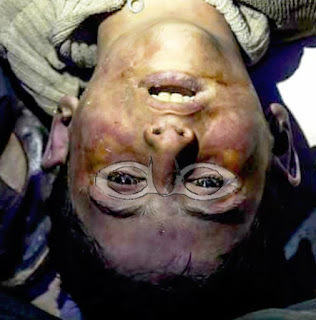 A thin rim above the upper eyelid, patches on the forehead, across the temples and cheeks, around mouths and noses, and especially in bands across the upper cheeks just beneath the eyes tend to be stained yellow to brown, or sometimes as if by blood, all seeming coughed up by people who were - horrifically - suspended upside-down as someone gassed them with something corrosive. And for unclear reasons, the killers had slapped swimming goggles on them, often secured unusually with straps, etc. so eyes and areas covered with straps came out protected - as noted, no redness, and no staining inside that goggle-shaped area. Livor mortis (reddening of the lower parts of the body, as positioned in the hours following death death) does appear in some cases as a varying clue. 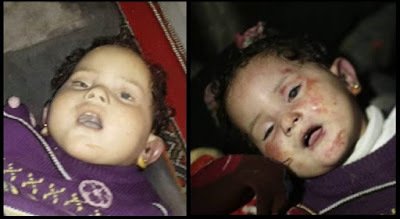 The boy above has more purple (the low-oxygen, cyanotic version of livor mortis) in the forehead and ears than anywhere else, again consistent with being upside down at the time of death and a while after. That's the same time those nasty burn-stains on his cheeks would have set in. (there's some light issue here, but the purple is clear enough in his lips as well to call cyanosis in his case). The woman with cheeks turned brown except under the straps … under the icky goo, her forehead seems to have a purple tinge as well. But in connection to eyes (as it's mentioned), some different redness appears, more like a rash, in a sort of mask shape just like the one described above. In this baby girl, that's especially clear, with patches of apparent irritation on the chin, etc. It seems to have developed slowly, much clearer in later photos (different lighting also plays in). In most cases, like the boy above, this kind if burning seems to play in, but is mixed with/concealed by the yellow staining. It usually effects the forehead more, and the chin less if at all. This baby seems differently and less stained, perhaps laid on her back instead of upside-down as usual, and with the yellow sputum was washed off earlier (to prime her for the coming photos that always favor the youngest dead?). Looks like they missed one less-important, yellow-stained earlobe. I suspect she was mostly left face-up so her backside will be livid and front side pale, and this redness is a caustic-induced exception to the general pallor. "8.101 The periorbital discoloration is not associated with any specific known toxic exposure. To determine whether it is due to a physiologic response to exposure to a toxic substance or simply post-mortem changes would require additional steps." Note how this important clue remains a total mystery to the FFM, one they didn't even venture a guess for. But it's a mystery we know more about than they would like. It's not a simple post-mortem change either. It's physiological. Once coughed out, gravity pulled the caustic, staining substance up their faces, until the goggles stopped the spread into the immediate periorbital area, but some rolled around the rims, and often rolled up the forehead before dripping off. One step they could take to investigate this unusual possibility; have a test subject hang upside down in swimming goggles and spit a viscous dyed substance up their face, check the resultant color pattern and note the match. This explains it. Nothing else I can think of does. And it might indirectly explain the following mystery as well. "8.102 The presentation of wet hair in an otherwise dry environment is difficult to assess and is possibly due to profound diaphoresis shortly before death." We could say this in similar to cold sweats (diaphoresis), but "much more profound and seemingly persistent," as they said for the foam. It doesn't seem quite right. It would be some odd, very slow-drying sweat... visible in the face and hair, but not in the armpits, etc. They ignore the provided explanation that the victims had washed themselves just before death, hoping it would counter the poison that made them basically drop dead (leaving their faces clean, but their hands still filthy, as if they all used someone else's hands, and not any of those on these dead people). Why would the FFM ignore that explanation? Because it doesn't add up to basic logic, or to wet hair 2-3 hours after their sudden deaths? But sweat just on the head does? It's fairly clear what happened here; someone else has washed their faces up, well after death, shortly before the first images were allowed. That's probably why there are sooty rags by sooty water and a discarded breathing mask all laying nearby. Why the faces, and cheeks and foreheads and hair, but not their hands and feet or clothes? Is this special and unusual washdown related to those bad-looking peri-periorbital stains, or some coughed-up yellow goo still in their hair, for example? 8.57 The three bodies that reached Point One on the night of 7 April had profuse foaming from the mouth, pale colour of the skin and a strong odour emanating from their clothes. The 40 bodies taken to Point One on the morning of 8 April arrived in groups, transported by the SCD. They were described as having a blue colour of the skin and foaming from the mouth; some had dust on their clothes. The bodies with a similar odour to those mentioned above were buried later the same day. 8.62 ...Witness accounts place the deceased lying on the stairs, inside apartments on multiple levels of Location 2, inside basements of neighbouring buildings across the area, on rooftops and on the streets. Additionally, a witness stated that six casualties died at Point One. 43 is the tally as given around, and here it's 3 bodies brought in + 40 bodies brought in, with no room for 6 more who came in alive but died. If these are included, presumably it's part of the 43 total. As for the 40 - it's said there were 35 bodies at location 2, (34 verifiable), so that would leave just five to be found in surrounding areas (at least 2-3 additional bodies not seen at location 2 are seen in later arrays). I still wonder why several sources reported or estimated that over 100, 150, 180, even 200 people had died from the chemical attack that night (see here). Nothing in the OPCW report seems to shed light on that mystery. "8.31 The analyses indicated that the structural damage to the rebar-reinforced concrete terrace at Location 2 was caused by an impacting object with a geometrically symmetric shape and sufficient kinetic energy to cause the observed damage. The analyses indicate that the damage observed on the cylinder found on the roof terrace, the aperture, the balcony, the surrounding rooms, and the rooms underneath and the structure above, is consistent with the creation of the aperture observed in the terrace by the cylinder found in that location. " It's not as clear if the experts and models show the cylinder stopping just outside the hole it punched to tip over on the roof. One can ask an expert in impact physics and/or what's best to say, and get him to say this makes sense. But in my humble opinion, they'd be evidently wrong and bonkers to say this scene lines up. It implies a totally implausible 100% transfer of kinetic energy from the cylinder to the ceiling, conducted against the laws of physics, entirely at the moment of impact. If the ceiling gave, it gave, and the cylinder would enter the room, at least enough to avoid tipping over above its rim. Whatever knocked this hole and flung that reinforcing bar so far inward must have entered the room. 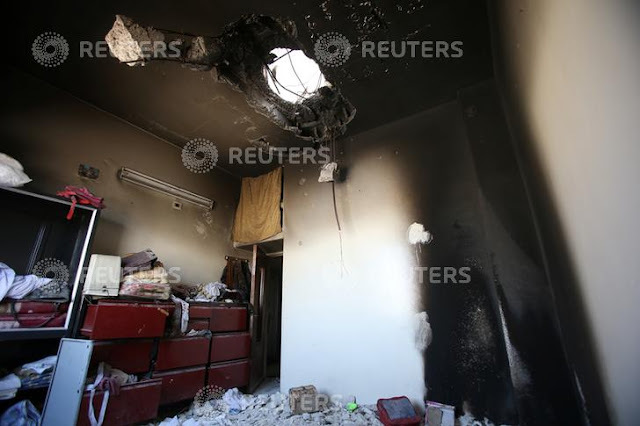 Whatever it was had a similar diameter (likely a bit smaller), had some weight/force behind it and - like this gas cylinder - it didn't explode after entering the room. It didn't start the fire that was lit on top of the rubble it created. Presumably, it wasn't this cylinder itself, or else why drag it back out the hole just to look wrong? But I could see this; some kind of giant cannon or catapult to launch it high up, it'd come down close to vertical. punch through, scrape off its harness … then get dragged back up there why? And I don't think the cylinder is damaged enough for this anyway. I suspect the cylinder was straight-up planted next to this pre-existing hole. The dents we see are likely from it being launched or dropped on rocks somewhere in hopes that would look plausible to the kind of experts the OPCW would go ask. The valve area is finally seen, it looks snapped off, not unscrewed as I had guessed. My point remains the same, but narrowed; this either happened on impact, or later, serving as the other of 2 methods to hide the melted out fusible plug I've suspected happened due to the fire someone set underneath the cylinder, the signs of which many have tried to ignore or explain away. Annex 6, point 9. "The FFM team noted the blackening of the ceiling and the rim of the aperture from the room immediately below the point of impact (see photo above). It also noted the blackened sooty walls in the corner of the room, as well as what appeared to be the ashen remnants of a small fire. One interviewed witness stated that a fire had been lit in the room after the alleged incident, reportedly to detoxify it of the alleged chemical." Also the fire was set and done burning before the first video timed at 10:06 pm (its soot line is already visible across the window wall, and the ceiling is visibly soot-gray as well). This is app. 2-3 hours after the alleged impact, but the cylinder is still frosted on a small part of its underside. All evidence I've seen suggests the cylinder like this would empty within about 10 minutes or less. Why would the cylinder only release its gas 2 hours or more after it landed? Why would someone brave the gas within the first moment after that to light this fire, before even these guys barely look and run away in fear? 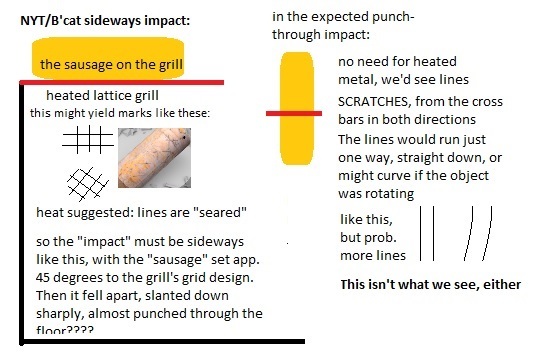 The FFM seems to favor the NYT/Bellingcat grilled sausage explanation for the supposed grid pattern "seared" into the cylinder from its initial impact with some wire mesh awning presumed to have covered the balcony. They're not sure if it was up at the time or already laying on the balcony, but somehow "the lateral aspect of the cylinder did not slide on the mesh but it hit perpendicularly." Maybe just after it totally stopped just outside the hole it punched, then tipped over so hard on the mesh laying there it rug-burned its pattern into the paint? Also, the "impact" has to have the canister stationary on the grid, long enough for that "searing" (by heat? or is it rusted on?) to set in. Not a very kinetic kind of impact. "Hey, I found the bullet that killed president Kennedy. You can tell because a picture of his face is "seared" into its side, showing that it must have impacted his head." This is clearly an exaggeration, but it's one of the same kind of absurdity at work here. 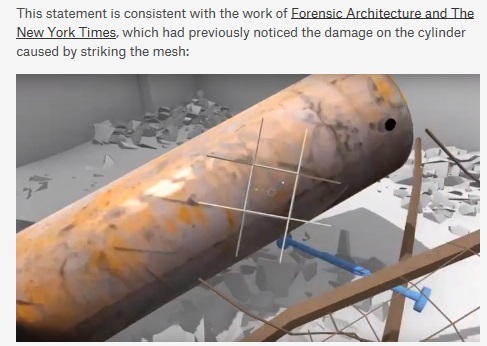 Bellingcat is excited the OPCW, besides the New York Times and Forensic Architecture already, "add weight" to this reality-impaired thinking. No one notices it's just one spot that looks like that grid, except for one wire that bends - other areas have similar lines one way, missing lines the other way, and the wrong spacing, and shifting pattern, and other scratches that don't fit. I'm not certain what these lines mean, but here's my more logical guess, and it suggests two guys pulling and turning the thing in a few small movements, as they dragged it into place, right next to that torn-down wire mesh. In one spot, they may have pulled and turned it so as to leave opposite marks crossing some of the first set, looking like a square grid in that spot (the one spot everyone latches onto). As for the "seared" appearance of the lines, I'm note sure; is it a rust/soot smudged on the surface? paint scraped, later rusting of metal? other?). There are some other stray lines that don't fit that pattern (just as there are even more that don't fit Bellingcat's partial-grid-and-similar-lines pattern). Maybe these are old scratches and it's all a coincidence. But the proportions re: that grid are uncanny. In the end I agree; most likely caused by the mesh - the ends of 3 or so bars of it. But it was, I think, a slower kind of contact, well after the mesh was torn down in the real impact that caused the hole. Note: their findings and thinking on this are strange and already widely-noted. As I never had a great feel for that scene, I put covering this as a lower priority. But I don't think it adds up either. It looks like the scratches are underneath the dirt on the 8th. Harness another possible for making those scratches, I'm sure someone could have taken measurements if it hadn't been stolen. A pity there aren't better photos for this as the cylinder always seemed more covered in light dirt than the frame and harness. 2.14 - all is "consistent" (Higgins has turned that into "perfectly consistent") with the creation of the hole in the balcony but is the cylinder consistent with the creation of the hole in the roof above (with or without fins)? Shown in Figure A.6.4 but did they go up and measure the damage? If there was damage beneath the hole in the bedroom, why has the FFM not included a photograph and why would Fadi Abdullah be "under the impression that it had arrived through a nearby window rather than the roof"? Figure 13 they have managed to produce a similar shaped cylinder in the simulation. There doesn't seem to be something comparable for the balcony cylinder, did that one not work? Figure A.6.6 has a note saying it is "not representing actual impact angle." - I assume this is meant to show the end deformation matches that seen on the cylinder but in that case why is it not shown here at the "actual impact angle"? Does it work with a harness or not? If the whole point of the fins is to stabilize and make the cylinder fall nose down, why does A.7.6 show it hitting horizontally and the other harness fall off? The whole harness/wheels/fins idea doesn't actually work but they keep using it? I see annex 6 #6 clears up the first question. They didn't measure the damage on the roof as it was too dangerous to go up there. So presumably they don't know. I'm certain the roof damage is old so the expert explanation Annex 6 #7 doesn't work. Hello, about the "bouncing cylinder", I was trying to make sense of the velocity graphs that were included in the report, especially the one referenced as Figure 12: Diagram Demonstrating The Possible Movement Of The Cylinder At Low Speed (page 19 of the OPCW final report). The caption implies that it's meant to simulate the residual velocity of the cylinder after impact. Though which impact they are talking about is unclear to me. According to the theory explored by the FFM, the cylinder would have undergone two major impacts: the first with the roof and the second with the floor of the room, before settling in its final position (the bed?). Am I right in believing that Figure 12 is meant to show the simulation of the impact of the cylinder against the floor of the room for two different possible values of its residual velocity after colliding against the roof (25 m/s for the orange track and 10 m/s for the blue one)? The graph shows a major decelaration of the cylinder: almost 25 m/s in less than 5 ms for the orange track and 10 m/s in less than 2 ms for the blue one. Those figures amount to an average decelaration of about 500 g.
Then we observe an increase in the velocity of the cylinder that quickly stabilizes to less than 2.5 m/s after a few more milleseconds. To me that looks like the cylinder bouncing off the floor. Or am I misreading Figure 12? Assuming I am not misinterpreting the graph, what I find interesting is that a residual velocity of less than 2.5 m/s would hardly allow the cylinder to bounce on the bed. Even using high school level physics and assuming the best case scenario of a point mass, a speed lower than 3 m/s would allow the point mass to reach a maximum height of less than 45 centimeters. And that's assuming that the bouncing speed is entirely upward (which is not consistent with the FFM's theory anyway, given the layout of the room). Pretty vague wording. When they talk about "the position in which it was found", are they talking about the bed or not? Anyway, the FFM might have based that sentence on simulations that are not included in the report, or I might just be misreading the meaning of the graph. But If I'm not, than the choice of the graph is puzzling, because it doesn't seem to actually support the "bouncing ont he bed" theory. "numerical calculations are represented in Figure A.7.7." A bit hard to tell when the FFM hasn't added a lot of explanation! Would assume "position found" = on the bed but I don't remember anyone else before their expert suggesting bouncing onto the bed was plausible. FWIW I always thought it looked as if the bed had only collapsed under the cylinder weight by the time the Russians filmed it. The FFM experts had to 'bounce' both cylinders to make things 'consistent' so would be interesting to see if it could also be consistent with being dropped from a much lower height (e.g. from the building they have modelled in figure 9). A.7.7 seems to be saying they think it also hit the wardrobe on the way down but the details are unclear to me given that they have only provided a single blue arrow as trajectory explanation. Maybe of interest too, I remember that it was Riam Dalati who suggested they may have 'started a fire to clear the chemicals'. And for the record, DK (and by extension Bellingcat) was perfectly happy to accept US claims of sarin positive samples. Russia's theory for the bed cylinder was that it never went through the roof at all. Alternatively the roof wasn't actually substantial enough to break the valve, how strong was the roof in reality? Leonardo, hi. Fig 12 app. shows that. Blue looks like a bounce, but orange never stops, never hits the ground? (that's zero, then reverse trajectory) I guess it's rounded off at 4.5 sec? Long time to hit for going so fast. No, I guess I don't understand this. Why else but a bounce would the velocity snap to zero and then back? I don't even have high school physics down per se ... you're likely right about a max. height. I wondered if the scene could line up with an angled impact so it flew right into the bed. (perhaps the same thinking behind the window notion) Possible, but it looks more staged. And as their presumption of landing right under the hole underlines, it has to be straight down to come from a helicopter. Which they clearly presumed. (angled impact, like through a window, would mean surface-launched). In a vert. drop, a bounce to one side could make sense if it landed on a fin, for example, but that really is a long way up and over. If there were an equivalent graph for loc. 2's cylinder, it would have orange and blue vertical lines from 25 and 10 down to zero over no time, if it tipped over before passing through the hole to the tipping point. Interestingly, they don't have such a graph, as you note, or any such visual explanation. Except one showing the ceiling would be disintegrated just fine, if the cylinder actually punched deep into/through it. Must've bounced a couple inches back on the rebar? As the rebar flew several feet in bouncing off the cylinder? And to add when I could see it flying in, it was not sideways like that, more like the final angle it's seen in. But I didn't know/consider the hole shape, and was a bit fuzzy on room layout. Andrew: that bed did collapse more over time. Never noticed that. Fig. a77 shows the bed collapsed as point of impact 4? It might be partly at first, but if that's the later stage, it is a bit misleading to show it as impact damage. Another question - did they model the impact on the valve going through the roof to make sure it would survive? Can't see a valve in figure 10. In figure A.7.5 fins and wheels appear to be different in the 2 diagrams. 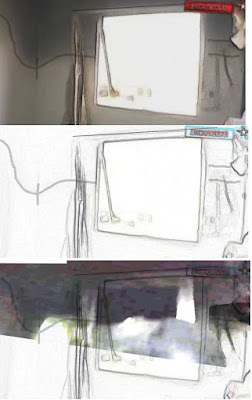 Are these based on dimensions of parts found or just an artist's impression? If the whole point is to knock the valve off on impact, why does this design have the valve surrounded by a metal harness that can apparently withstand going through a roof? Has anyone ever checked if these designs even work? The fact that the orange line in figure 12 doesn't show the speed going to zero before increasing again might perhaps be ascribed to the resolution of the time step of the simulation (i.e. the speed went to zero in between the two consecutive instants that were sampled while the simulation was running). Here I'm just guessing, but that's all I can do since the pictures the FFM included are not self-explanatory to a satisfying degree. About the impact and trajectory, it doesn't look like the investigators ever seriously considered the angled impact of the cylinder. Or at least, that's not the version they try to defend in the report. Figure 10 on page 18 clearly shows the simulation of the cylinder colliding sideways against the roof and causing the hole in the concrete ceiling before dropping to the floor almost vertically. What irks me the most is that the report is so sloppy that people are compelled to guess and and try to fill the holes themselves. Even many of the figures appear to have been included more as window dressing for the press rather than as useful tools to illustrate a technical conclusion. It was the same with the JIM's Khan Sheikhoun report, frustrating as they were the only ones in a position to answer the many questions. Good for those who just want to copy and paste the 'conclusion' to 'battle the Kremlin' and 'regime', not so good for those wondering what actually happened. I'm sure there will be plenty of people defending the investigation (though they were not personally involved), pointing out how 'exhaustive' the expert analysis is (lots of pages=detail!) and dismissing any questions as 'conspiracy theory'. So we're left with the cylinder deploying 'barrel bomb wheels', landing and taxiing over to the bed. Plus the mystery of why this chlorine is unpleasant enough to make people run from the basement except when it is upstairs in the apartments with the same people who then instead.. stay to die en masse. A question BC's lovely chemist friends don't seem to understand. Perhaps just easier for the OPCW to blame the Syrian gov - no embarrassing the US and allies, no having to consider fakery and the SAA will still protect the inspectors (unlike the opposition who they can't visit for fear of being kidnapped and murdered). The bedroom cylinder is also flattened on the end. Possibly they can be made this way, but it reminds one of the Saraqeb cylinders in February with the flat ends and cloverleaf imprint, probably from spacers in the press they used (valve seems manually unscrewed here). Here, no imprints - improved pressing? And it's inconsistent with a sideways impact. Why? Leonardo - window dressing - well put. Another thing they do is waste a page on a giant pie chart that just shows most people interviewed were male, things like that. In lieu of a bunch of other useful stuff … they don't want to be very useful? Impact with the bed headboard? But would that have enough force to flatten the cylinder top? A thought - if the cylinder diagram is not based on measurements and just an artist's impression, is the computer model in figure 13 also an approximation as it appears to match the design in A.7.5 (minus fins etc.) rather than the actual harness? You have probably already seen but Hitchens offers another expert's opinion on bouncing bed cylinder, valve etc. There is a definite parallel between 'stars having to align' yellow cylinder drops (2 sets of stars aligning in this case!) and the disproportionate amount of 'stars aligning' miracle rescues by the White Helmets. Both just seem unrealistic. - Annex 6 4 "it was not clear whether this [metallic frame and mesh] would have been present at the time of the alleged incident or had been demolished prior to that." 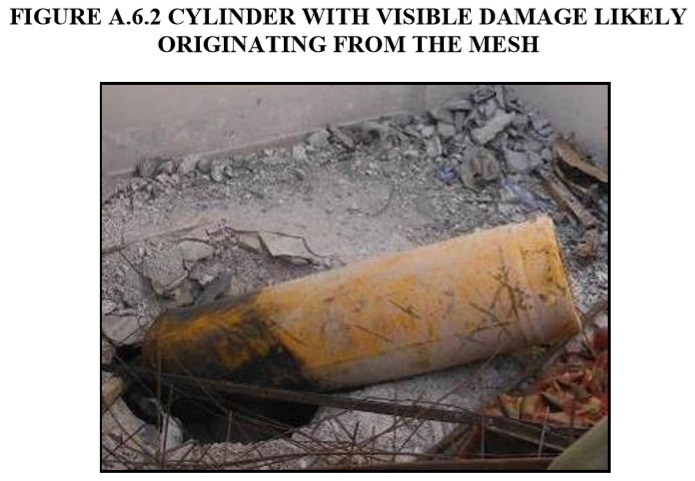 - it is unclear how the FFM then squares this with the cylinder "likely" having "hit perpendicularly"
- Tells bizarre lies: Annex 6 10 "the cylinder was moved a number of times prior to the FFM visit"
- Trajectory explanation: the cylinder "wound up in bed"
- By ignoring that they had to get all the way up to the apartments, split up over different floors, apparently do some washing and then (8.96) "do not appear to have been in the midst of attempting self-extrication or respiratory protection when they collapsed, indicating a very rapid or instant onset"
- Symptoms don't match chlorine reported by Lucas himself(!) and others inc. UNHRC COI A/HRC/38/CRP.3 para. 52 "largely consistent with the use of chlorine, but this in and of itself does not explain other reported symptoms, which are more consistent with the use of another chemical agent, most likely a nerve gas"
Anything else that disagrees Lucas describes as "disinformation". Cleared everything up there! The dust cloud over Douma was huge, would surely have implications for very low level helicopter drops. If the accusation is that anyone in a gov controlled area is 'coerced' (or even goes near a Syrian gov building), even if someone came forward to say the victims were in fact JaI hostages or it was faked how would it be possible for them to tell the world without their account being dismissed? Even appearing at the Hague isn't enough so what are they meant to do? the anti-Assad side seems to have thrown away the bar for evidence. No proof of guilt too low and anything that might exonerate literally impossible to be accepted. It takes just seconds to search "sananewsworld" and find it has barely been mentioned and is not the official account. This seems to also apply more generally with not watching the videos, not reading testimony, not knowing the allegations but always asserting they are true and the 'regime' is guilty. To correct myself above and be exact, SlugBub refers to 30m/s not 60m/s (so the roof impact). Why the FFM's experts think the helicopter has changed height between the two drops is a mystery. As is the actual live broadcast of the event and satellite photos of the damage not being mentioned as evidence in the OPCW report. In their case, they could equally say they weren't forcing Iraqi teenagers into rivers as they wouldn't do it (the same argument as the SyAAF not using chlorine cylinders).. and they would probably be told by accusers it was 'obvious' they did, the family were paid off and there are 'large amounts of evidence' "wetting" was standard practice. Surprised they are not more open to the idea that the accusation doesn't match the reality. 1. It doesn't take any special qualifications to recognise that something in a hole above a soot covered room with a similar blackened part over the hole is likely soot too. 2. At least one witness has now said they *did* light a fire so no argument that any analysis of photos or video was wrong. I think the 'BC chemists' reaction to a Hamish de Bretton-Gordon quote in the Peter Hitchens piece shows why we really need an opinion on chemistry from outside of that group. Looking at various free fall calculators that are around, including air resistance might work for 60 m/s (I don't think SlugBub's calculations allow for that) but the balcony cylinder at 50 m/s would still mean far too low for a helicopter even before considering whether roof damage is historical and it doesn't explain the bed cylinder 'bounce'. Perhaps the theory is the bed cylinder initially ricochets off the building to the south -which is why that building was modelled? They seem to have had to bounce both cylinders around already just to make things 'consistent' so would be interested if anyone has found a way to explain the figures presented. Much has been made about the 'finding of chlorine' but something to consider: we know for certain that the twin girls Masa and Malaz had a purple t-shirt that "smelt like a swimming pool" in the camp in northern Syria. Any fakery would include the foresight to add something to this t-shirt, so it is not a stretch that whoever did that could also use that something in the apartment building. 50-60m can only be the building marked to the southwest of basement in Figure 4. Masa and Malaz basement (3 alleged deaths) is one of those marked immediately west and south as 3 basements total in that same street. This one also too heavy to have been carried there? 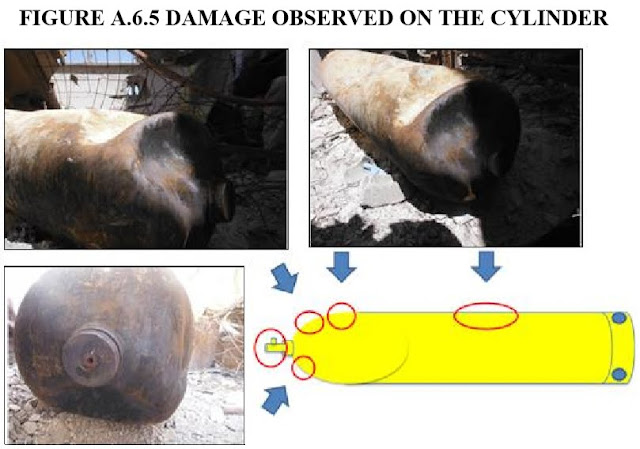 If anyone cares (which I doubt), the size looks to be 150 lb cylinders "Full 150 pound [chlorine] cylinders will weigh from 235 pounds to 290 pounds"
Brian Whitaker incredible theory: Syria and Russia can't plant an identical cylinder despite the SyAAF using them 'all the time'. And JaI can't make a crappy metal frame.. just a city sized tunnel network. Clyde Davis calculates a massive 200kg when full (!) before fins etc. For the sake of argument we'll say Davis' figure is correct and the cylinder was full, without fins to correspond with the 50m/s shown in fig. A.6.6 would mean the helicopter was flying at only ~152.5m above the balcony. The live broadcast shows that is: in the dark, in a dust cloud, above a war zone wanting to shoot them down. For bedroom cylinder, to match the 60m/s in fig. 10 the helicopter would have to be only ~242m above. Which would be completely stupid and implausible. The FFM mention no testimony about seeing or hearing a helicopter at all. 8.58 only states "barrels falling". (Mother of twins) Amani: "Then it was quiet, and we heard two bangs"
Mohammed al-Hanash does say he heard "the whirring of helicopter blades" but that NYT article describes the balcony cylinder as "a third canister" so Hanash was somewhere else being hit by other 'chemical barrel bombs' they apparently never found (or just didn't exist). Diaa Mohammed (father of twins) told the BBC he heard a helicopter that "passed over" before they were told to "go down one floor" (i.e. before even going into the basement) but there are no witnesses to a helicopter hovering above that area at low altitude. One last thought: 'Detoxify with a fire' - but just the one room below the balcony. No detoxifying e.g. the basement or apartments downstairs where gas lethally built up? Someone could get up there and start a fire while activists/WHs couldn't retrieve bodies below "due to the intensity of the odor and the lack of PPE"...! "Amani phoned neighbours and friends to warn of the gas attack. But for many, it was too late." There was "36 Telephone from the basement (level -1)" but that basement had a land line. So where are all the mobile phones and personal effects of the victims? Scott Lucas explains the "severity of attack" caused medics to accidentally report symptoms of miosis, convulsions, disruption to central nervous systems and rescuers becoming sick through simply touching the bodies (despite the fact chlorine "does not explain other reported symptoms"). And the US to accidentally claim it had urine and blood samples positive for chlorine and a nerve agent from the *zero* verified victims. - A girl from the basement next door who has just been knocked unconscious by the same lethal chlorine being at the hospital at the exact same time as a boy who says it was staged with the FFM observing "none [of the children] appear to be ill"
All coincidence. All to use a 'terror weapon' to make people 'run away' by Postol's theory... but only after hours and hours of bombardment. Two of the young men in the basement volunteered to go and look to see what was happening. Seconds later, they came bolting back down. “Gas! Gas!” they screamed. “Everybody out!”"
"As Amani climbed up [the stairs], she saw white gas and dust pouring down past her"
Perhaps one of the many chemist/gas dispersion experts can work out how much chlorine could be pouring down the stairs seconds after hearing the cylinder 'land on the balcony next door and hiss'. 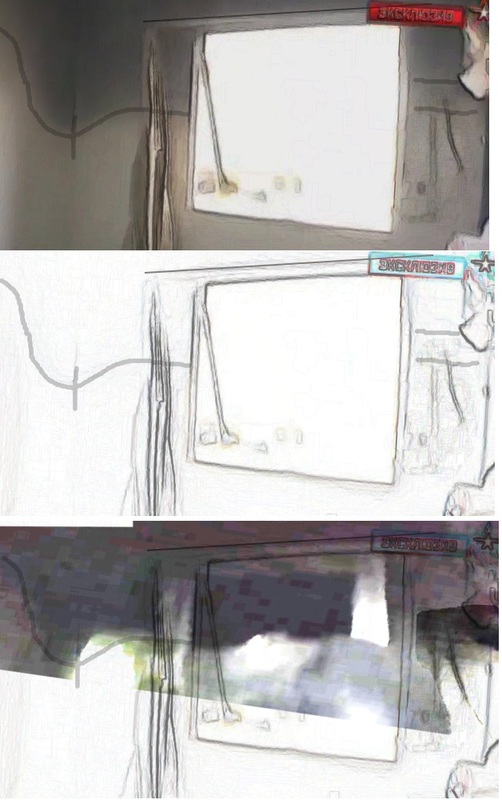 And how much it would take to make everyone from the neighbouring basement 'fall to the ground' and 'foam at the mouth', Masa's purple top "smell like a swimming pool" and still "reek" one week later and then how she might be expected to look when arriving at the hospital immediately after that? Or maybe it is the kind of story they might come up with if, like Hamish de Bretton-Gordon, they didn't know you can't actually mix chlorine and sarin and so would try and fake a ‘chlorine and nerve agent mixture’ attack with the only thing they could get- a chlorine cylinder. 2:14 am: Zaher Sahloul, SAMS chief, already heard "Latest estimate of death ...is 180 mostly women and Children." No mention of an expected rise past that. Was that really just some error? Was he just rounding down the original toll prior to the change? Possible total of people in the 3 basements in that street? Supposedly ~75 in the next door basement and unknown number in the 3rd. I'm behind enough on the multiple basements w/deaths aspect that I should make a study and post on it. As you've noted, there's no explanation for that AT ALL. Chlorine would kill nowhere, let alone in whole other buildings … who claimed other sizeable batches of dead … why they dropped it is kind of obvious + whatever other reasons - I doubt the other basements were ever staffed with the bodies to go with that story, but they were killed, prob. in A basement, and a story went out, but lacked for evidence support and fizzled out. Seems worth reviving it, and then seeing about some follow-up. Devil's advocate: For helicopter drop, I'd point to the lack of FFM mention of cylinder frost so not used as evidence. The dirt in earliest photos could possibly appear white the night before. 'Mesh' cylinder scratches do appear to be under the dirt. "Honestly we did not realize that the attack was chemical"
"almost an hour later when we learned that the attack was with toxic gases"
"there were nearly 600 injured"
"It poisoned them and they died immediately." Different footage from the following morning? Undignified way to carry.